When I was a child in the 50’s I had a doll’s house inhabited by my made up family – the Pobblejoys. I think I might have been a bit influenced here by Edward Lear and ‘The Pobble who had no toes’ – anyway that’s what I called the family that lived in the house. It was a cupboard – my Dad put in some room divisions for me – it had 3 stories, but no staircase – that didn’t matter. The bottom story was of course the kitchen etc, next was the drawing room and above that the bedroom and nursery. They were quite a posh family with cook, maid, nanny, governess etc – largely due to the available little dolls which I bought with pocket money from Hamleys in Regent Street. I’ve always been fascinated by small houses and their furniture and inhabitants – anyone read The Borrowers? They are real as far as I’m concerned. 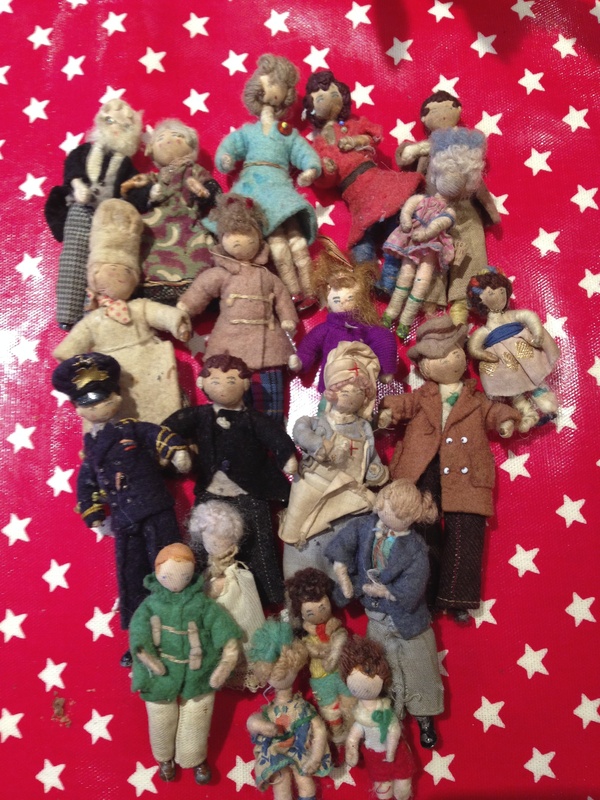 The Pobblejoys were lost for several decades – but not forgotten – and now have been rediscovered by my sister in Yorkshire. Here they are – amazing! no question about it-the borrowers are real-I was totally immersed in their world as a kid…I think the pobblejoys (and people like them)go into suspended animation when they are accidently ‘put on the back burner'(not literally of course! )-time has little meaning for them and they can pick up where they left off- they never hold a grudge and are quite sanguine about being left for a while. i’m so glad they’ve been rediscovered-I wonder why they moved to Yorkshire-probably a financial crisis-or some family scandal.that under maid looks a bit of a flibbertigibbet-and it was rumoured that mr pobblejoyhad an eye for the ladies…. I don’t think it would be quite the thing to ask them though-they’ll tell you in their own good time. hi there!yes-things are fine this end,and with you I hope..-might be a little stressful here til things settle down-after closing the shop -was it 5 years ago this year?,seems like 5 minutes!-I have decided to do a bit of pottery again-I thought i’d never pick up a bag of clay again-as it was when I started,economics rules our lives and so it is now-a small income from my paintings-and a bit more from pottery,so that’s the way I must go-but it means reviving old skills-I hope my old brain cells can take it! I don’t really mind so long what form it takes ,as i’m creating something…I am a human pobblejoy!! I hope they’ve now settled in Yorkshire! !